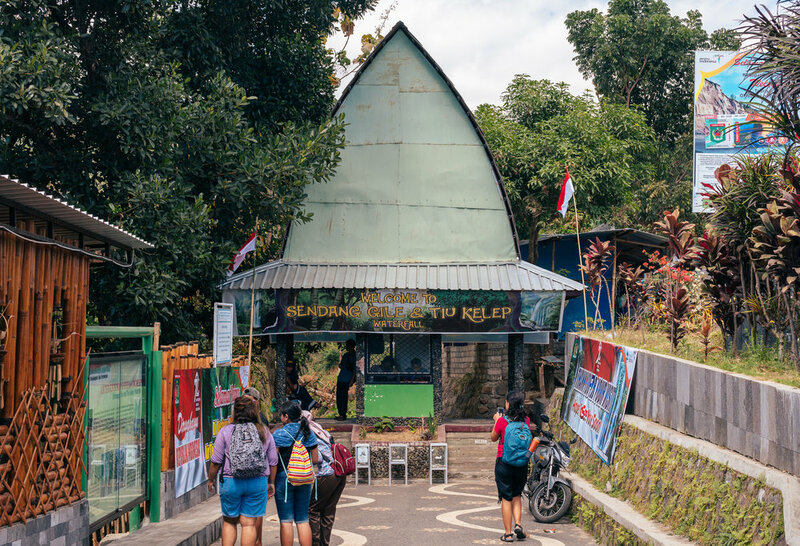 After spending a tropical three weeks between the different beaches of the Gili Islands and Lombok, we decided to switch it up and take a day trip to visit Lombok's most popular waterfalls: Sendang Gile and Tiu Kelep. These waterfalls are at the base of Mount Rinjani, the second-highest active volcano in Indonesia. The Tiu Kelep waterfall is so much more majestic than it seems in photos! What's the best way to get to the waterfalls? Once you get to Lombok, you'll soon realize that if you go just outside of the main cities, public transportation is almost non-existent. So, if you want to tour these waterfalls on your own (something that we recommend! ), your best option is to rent a scooter, a car, or to hire a private driver for the day. On our way to Tiu Kelep Waterfall! Our starting point was Mataram. From here, it took us around 2-and-a-half hours to get to the waterfalls by car. The cost of a private driver for the whole day was 500,000 Rp (around $37), which is a pretty significant expensive for us. If you've been following us for some time though, you know that we can't ride scooters – it’s sad, but we know we're not alone in this regard! Although our budget is extremely tight, our confidence is much higher on four wheels than it is on two (especially on the streets on Indonesia). So when we find ourselves in these kinds of situations, we prefer to pay a little extra and visit the places we want to visit. And believe me, visiting Tiu Kelep is 100% worth it! On our way to Senaru, through winding roads and cliffs, we made an impromptu stop when we spotted a mini "Monkey Forest" with about 30 monkeys posing, jumping, and running around. From the looks of it, this is a place where you can regularly find these monkeys. While we do recommend you stop to observe them (they're fascinating! ), be careful. As cute as they are, they're still wild monkeys. Get your photos and selfies in, enjoy the stunning views of the surrounding area and precipice, and then get back on the road. I personally love monkeys! One of the reasons why I love them even after traveling through SEA for 5 months is because I'm careful around them; I don't get too close and I keep my belongings and food stored away. They're just not as cute when they're stealing your sunglasses, your purse, or your bag of food. In any case, if you stay far enough away, they won't bother you and you'll be able to enjoy these funny and adorable creatures! Next to the main entrance, you'll find a parking lot where you can leave your motorbike or car. The main entrance is basically just a minute's walk away from there. Please keep the following in mind: The entrance fee is only 10,000 rupiah ($0.76). In fact, there is a big sign near the entrance that says the official price, and it's the only fee that you're required to pay on the way in, so don't allow yourself to be scammed by anyone at the entrance who says otherwise. Also, there will be local guides offering to accompanying you for as little as 30,000–50,000 rupiah ($2.27–$3.79). This is especially true when you get to Gile Sendang, the first waterfall, where locals will try to guide you to the next waterfall, Tiu Kelep. 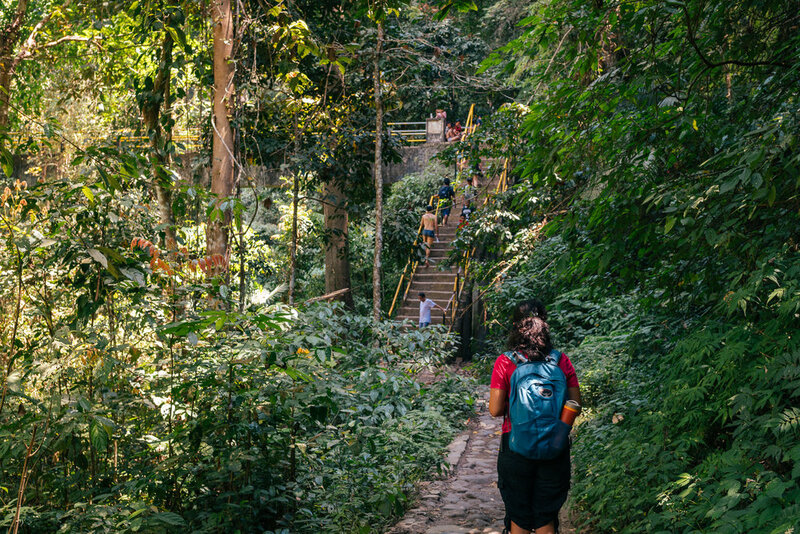 Our advice is to not hire any guides, since both waterfalls are very easily accessible without a tour guide; thousands of people visit this waterfall regularly, and the path leading to it is easy and well-maintained. The only usefulness we saw to hiring a guide was when it came to needing a photographer at the waterfall, or someone to look after your belongings when you want to venture further out into the waterfall – but nothing really guide-related. 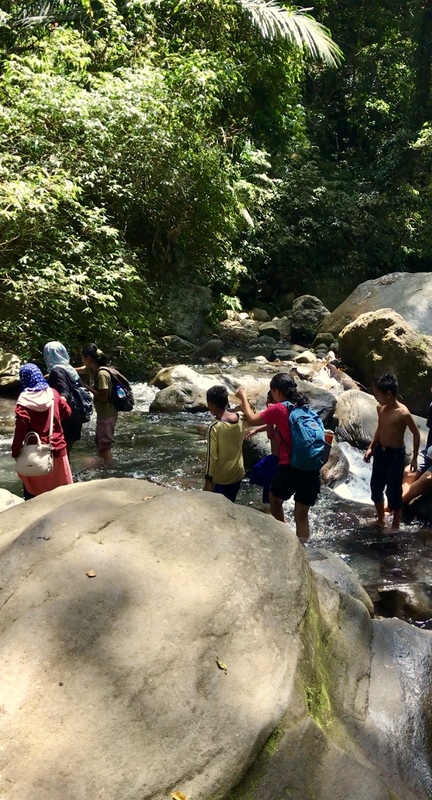 Gile Sendang is the first waterfall you'll find just after 10–15 minutes of walking. This trek is exceptionally easy, as the path there is paved and not steep. The route to Sendang Gile and Tiu Kelep waterfall begins here! Even though this grandiose waterfall is beautiful on its own, our main reason for visiting – the Tiu Kelep waterfall – still awaits! At Sendang Gile, trying to perfect the art of the piggyback. You'll be starting from the bottom of the stairs that originally led you to Gile Sendang. Now you'll have to ascend these stairs until you get to a small shelter (only about a minute's climb, pictured below). When you get to the small shelter, make a left. We asked local kids at the small shelter to make sure we were going the right way – but it's really pretty simple, the crowd generally goes in that direction. Tiu Kelep awaits, to the left of this shelter. 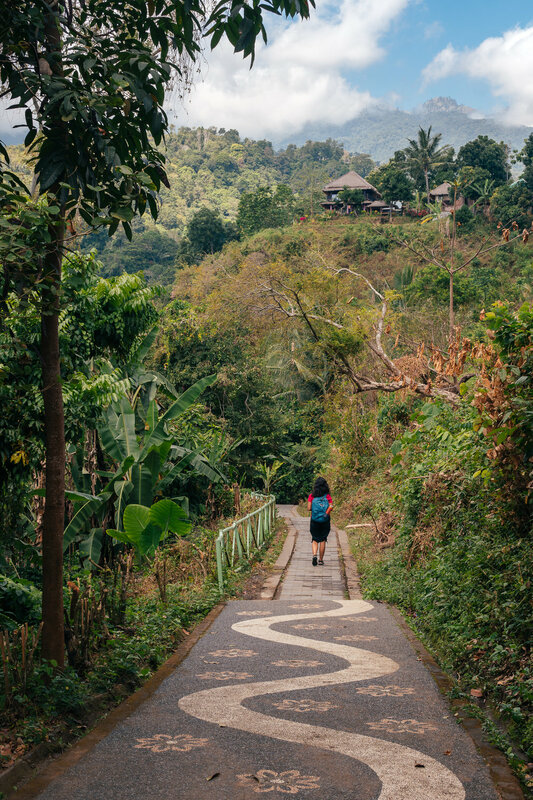 Although the path is not as entirely paved like the one leading to Gile Sendang, it is still an easy and pleasant walk. A few minutes into the walk, you'll get to a bridge that you need to cross. 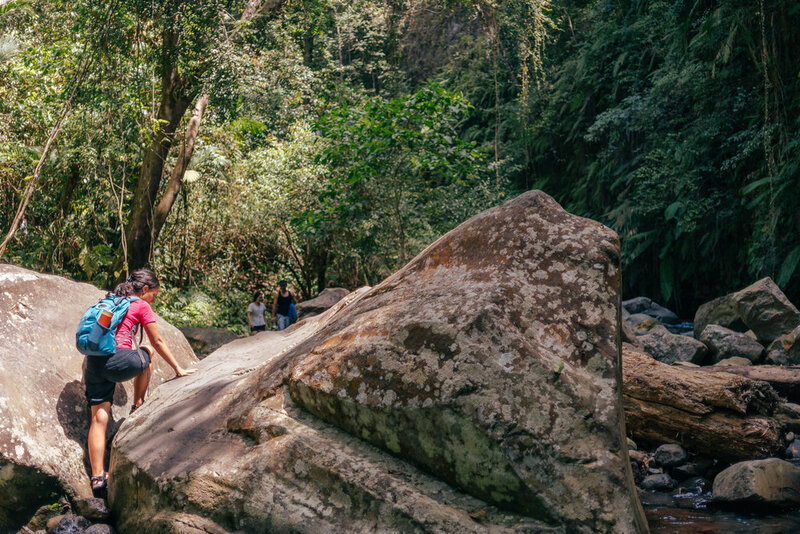 Crossing this bridge will get you closer to Tiu Kelep waterfall. After this, follow along the path until you get to a river that you'll also be crossing. Although it may initially seem tricky, just walk steadily (step on stones in the river that are firmly in the ground) and avoid the current. If you're lucky, there will be local kids there helping out and it'll be a piece of cake! Necessary footwear: Bring appropriate footwear like this to make the whole journey easier, the river is deep and will cover you above your ankles – that along with the wet sloping stones can make the whole thing pretty slippery. Climbing certain rocks can be challenging because there’s nothing to grip on your way up. After you finish the two stretches of the river, you're almost there! After just a few more minutes of trekking, you will have to go through two boulders to get to the actual waterfall. This is probably the trickiest part, as they are slippery and there's not much to grab on to for support, so just take your time. Getting to Tiu Kelep from Sendang Gile will take about 30 - 40 minutes and is very much worth it! Here’s what you’re rewarded with! 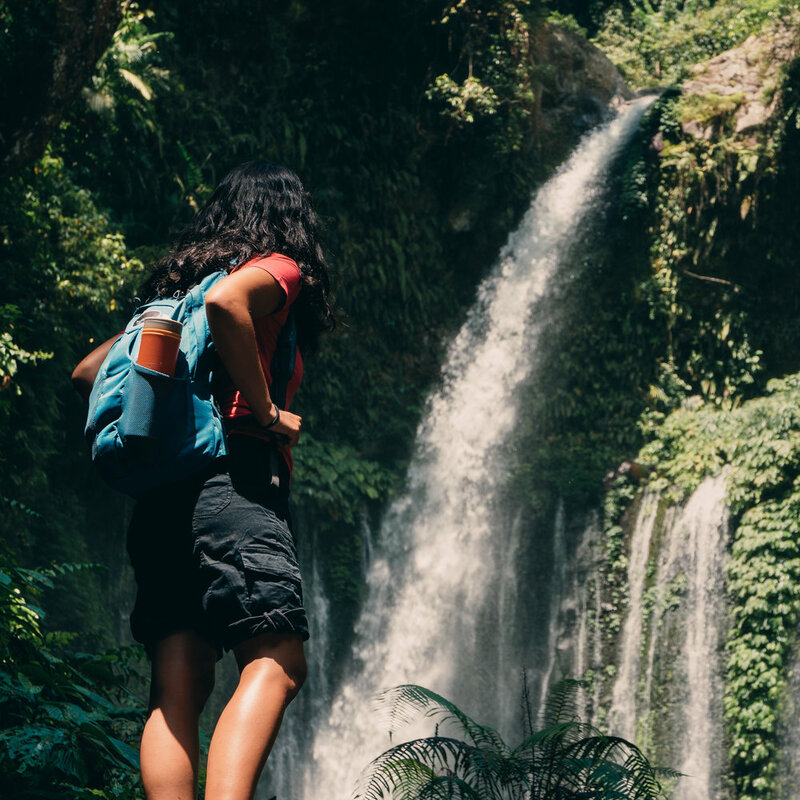 We hope this short guide helps you on your future visit to these beautiful waterfalls in Lombok! Like we mentioned earlier, although this was one of the easiest treks we've done, it was one of the most rewarding ones on our trip thus far. One last recommendation before you go: Try getting there earlier on in the day! We got there around 12 - 1 pm and it was FULL of people. If we would've pushed our plans earlier into the morning for this excursion, we probably would've been greeted with even more photo opportunities and less of a crowd.